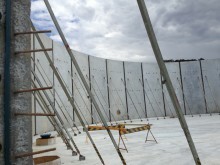 Temporary pedestrian bridges on and around construction and building sites provide safe foot traffic for site workers and the public. 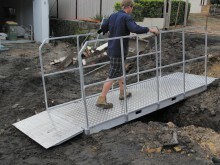 Our strong aluminium pedestrian bridges are the safe and secure solution when your job requires access over trenches and excavation works. A key safety benefit of our bridges is their adjustable end ramps, which allow sturdy fitting across uneven or muddy surfaces and provide easy transit with no steps, for less mobile pedestrians. 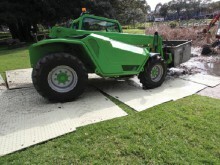 Portable Rumble Grids provide a driving surface that gently vibrates a moving vehicle to remove debris from its underside and dislodge dirt and mud from tyres. 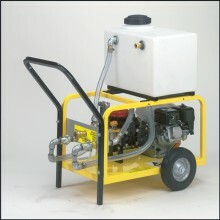 As well as providing a service to visiting vehicles on your site, rumble grids provide substantial savings in general cleaning time and costs. 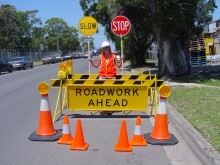 Positioned at exits, they keep roads and paths beyond the construction site’s boundaries clean and clear, reducing ongoing maintenance of these areas. 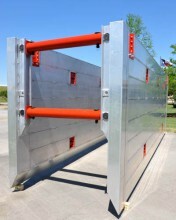 Our rumble grids are safe, easy to use and clean, and require almost no maintenance. 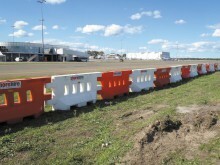 Sturdy, lightweight Trak Mats protect construction and other surfaces against traffic damage. 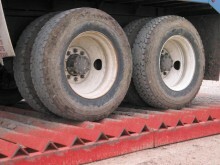 Non-absorbent and non-slip, they are designed to disperse mud and debris for the safe traction of rubber-tyred vehicles weighing up to 30 tonnes. Cut-out carry handles make Trak Mats easy to distribute across a worksite and quick to collect and pack up when no longer required. 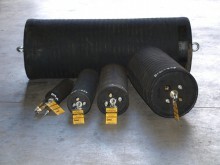 Multiple Trak Mats can be connected to cover a large area, using the provided accessories.